Figure 2. 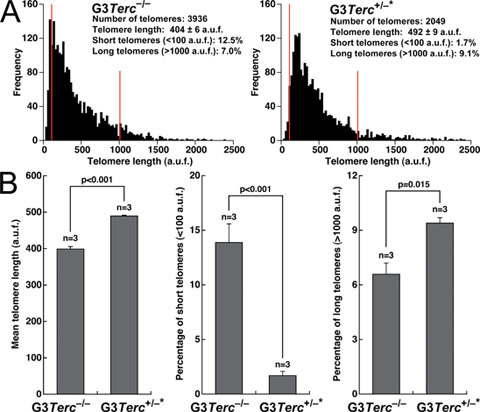 Rescue of mean telomere length and percentage of short telomeres in late generation telomerase-reconstituted G3 Terc+/−* keratinocytes. (A) Telomere length histogram obtained by Q-FISH in primary murine skin keratinocytes. The histogram shown is representative of three independent pairs of G3 Terc−/− and G3 Terc+/−* littermates (see B). Note a greater abundance of short telomeres in the G3 Terc−/− mouse compared with the G3 Terc+/−* littermate. Red lines facilitate visualization of short (<100 a.u.f.) and long (>1,000 a.u.f.) telomeres. The total number of telomere dots used for the quantifi cation and the percentage of short and long telomeres are indicated. (B) Mean telomere length is signifi cantly increased (P < 0.001) in G3 Terc+/−* compared with G3 Terc−/− mice. Concomitantly, these mice show a signifi cant (P < 0.001) decrease in the percentage of short telomeres and a signifi cant (P = 0.015) increase in the percentage of long telomeres. Data are mean values ± SEM for three independent pairs of G3 Terc−/− and G3 Terc+/−* littermates. In plain English: G3 mice are unable to make telomerase and their descendants live shorter and shorter because of this. They themselves age prematurely. If you splice in one copy of the telomerase gene (G3 Terc +/-,) the numbers of telomeres drop from 3936 to 2049 but the critically short percentage drops from 12.5% to 1.7%. A reasonable conclusion might be that when telomerase is reintroduced into the progeric mice, p53 and other mechanisms are at work to force bad cells into suicide.